Printed at the Government Printing Works, Paris. Historically, Khmer society began in 7th century and peaked in terms of power and civilisation in the late C14th. The next 350 years were characterised by gradual decline and continual conflict with Siam and in 1847 it accepted the suzerainty of both Siam and Annam. 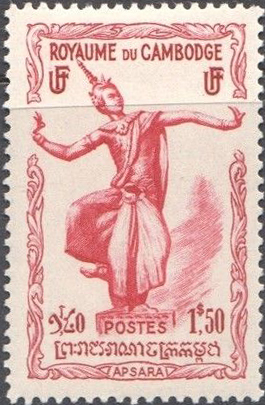 In August 1863 Cambodia became a French Protectorate and the part of the Union of Indo China in 1887. Japanese forces occupied the country from 1941-45 and in March 1945 King Sihanouk proclaimed independence. 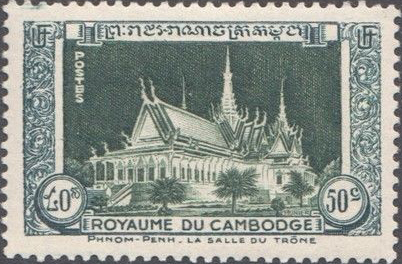 In November 1949 Cambodia became an Associated State of the French Union and gained independence in November 1953. It left the Union in September 1955. 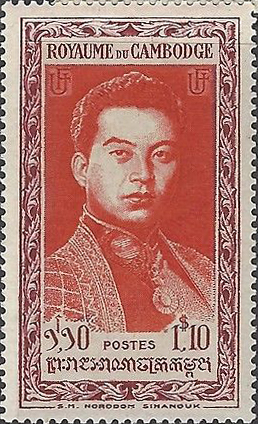 In March 1970, Prince Sihanouk was deposed whist visiting Peking and later allied with the communist Khmer Rouge faction. In October, prime minister Lon Nol proclaimed the Republic. The Khmer Rouge forces gradually gained ground and in 1975 captured the capital, Phnom Penh, ending the Republic. A period of isolation and repression of the population followed: no stamps were issued during that period. 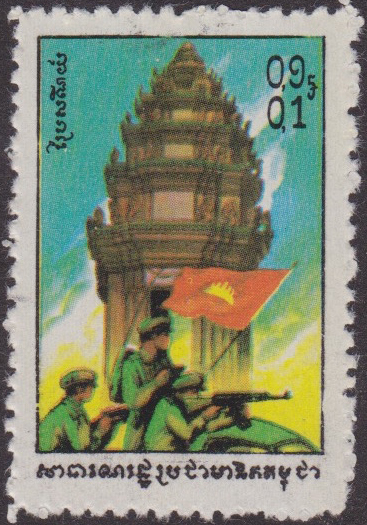 Vietnam invaded Kampuchea in December 1978, took Phnom Penh in January 1979 and the People's Republic of Kampuchea was proclaimed a few days later. 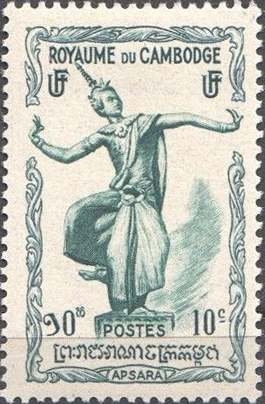 Stamps were reintroduced in 1980. Vietnamese forces withdrew in September 1989 and the United Nations participated the country's administration: the name reverted to Cambodia. In May 1993 an election held resulting in a new constitution on September under which Cambodia became a parliamentary monarchy and the UN withdrew. 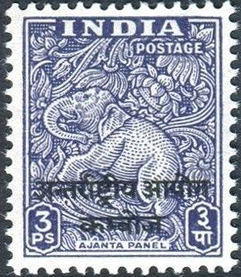 India, Canada and Poland supplied troops under the International Control Commisions for Indo-China in 1954 and India organised their postal services using overprinted Indian stamps. Gibbons lists these as a separate entity in Part 21, South East Asia, † Scott lists them after India, with sections for Cambodia, Laos, Laos and Vietnam, and Vietnam. Image from David Olson, TB, ebay.